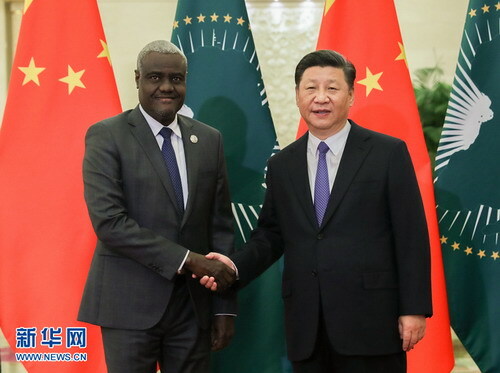 BEIJING, Sept. 5, Chinese President Xi Jinping on Wednesday met with Moussa Faki Mahamat, chairperson of the African Union (AU) Commission after the 2018 Beijing Summit of the Forum on China-Africa Cooperation (FOCAC) which concluded Tuesday. Xi expressed thanks to the chairperson for making important contributions to the successful hosting of the FOCAC Beijing Summit. Noting that the AU is a flag guiding Africa's unity and self-strengthening, Xi said China consistently supports the role of the AU in the process of Africa integration and supports the AU in playing a more constructive role in the development of China-Africa relations and FOCAC affairs. In recent years, China and the AU have reaped fruitful results in cooperation and conducted stronger communication and coordination in international affairs, Xi said. China is ready to use the success of the Beijing summit as an opportunity to enhance alignment of strategies with the AU, jointly build the Belt and Road, deepen pragmatic cooperation, expand security cooperation and promote capability building, Xi said. China firmly supports the AU and African countries in solving African problems in African ways, supports boosting capabilities in peacekeeping and maintaining stability, and supports the AU in playing a greater role of guidance and coordination in transnational and trans-regional cooperation, Xi said. With the success of the Beijing summit and under the leadership of President Xi, Africa-China relations have found out the right direction and chosen the right path, Faki said. 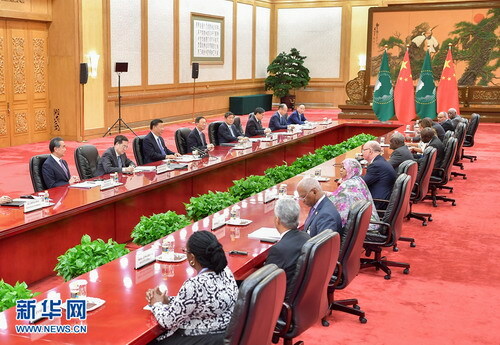 Noting that the eight major initiatives proposed by President Xi highly match the Belt and Road Initiative, the AU chairperson said the eight initiatives will help the AU realize its 2063 Agenda and will surely promote peace and development in Africa. African people are thirsty for happiness, which will be impossible without peace and development, he Faki. China has won the hearts of African people, and African people will never forget that, said the chairperson. The AU is ready to work with China and African members of the FOCAC to implement the consensus reached during the Beijing summit and bring benefits to African and Chinese, Faki said. The AU is committed to integration in Africa, opposes protectionism and unilateralism and is willing to enhance coordination and cooperation with China in international and regional affairs, the chairperson said.